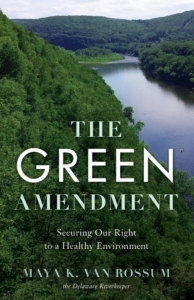 Morgan Outdoors is excited to host Maya van Rossum, the Delaware Riverkeeper, for a discussion and signing of her book The Green Amendment: Securing our Right to a Healthy Environment. Wes Gillingham, Associate Director of Catskill Mountainkeeper, will introduce Maya. Maya is a veteran environmentalist and licensed attorney who joined the Delaware Riverkeeper Network in 1994 as executive director and since 1996 has served as the Delaware Riverkeeper, championing the rights of people to a free-flowing, clean, and healthy Delaware River and its tributary streams. Van Rossum is currently advancing The Green Amendment movement, seeking to inspire and secure constitutional protection for environmental rights across the nation. The Green Amendment includes a powerful foreword authored by Mark Ruffalo. The book will be for sale and a BOOK SIGNING will immediately follow the program. RSVPs required. Simply call (845) 439 5507 or send an email to info@morgan-outdoors.com. Thanks! Anderson on Catskill Fire Tower Passport winners! photography ideas on Birds, Beer and Solutions On August 8th! fine art photography on Catskill Fire Tower Passport winners! Joni Brien on Birds, Beer and Solutions On August 8th!